I loved this original and funny book but you may not. A good test would be if you are a fan of Lewis Carroll's 'Jabberwocky' and will therefore see it as part of that tradition. If you think making up words is just silly, don't worry yourself with this book. 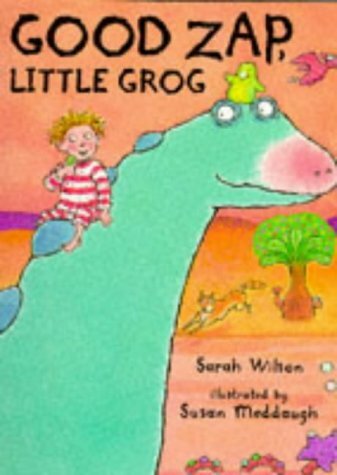 It consists of three poems addressed by a mother to her son, little Grog. One is for waking up, one for the daytime and one for bedtime. The twist is that little Grog inhabits another planet, with many strange creatures and plants and much new vocabulary and so we earthlings may be puzzled by the glipneeps which are jumping and ready to fly, or unaware of what wild fribbits do. Despite this unfamiliarity, this is a splendid world, full of colour, rich language and wonderful creatures. The poems roll off the tongue (and challenge young readers' phonic skills) and the bold, colourful pictures invite all sorts of speculation and imaginative ideas. This is a real find for anyone who loves playing with language and ideas.